Click here to download the BIG 3000x2250 map (with all cities and towns labelled). 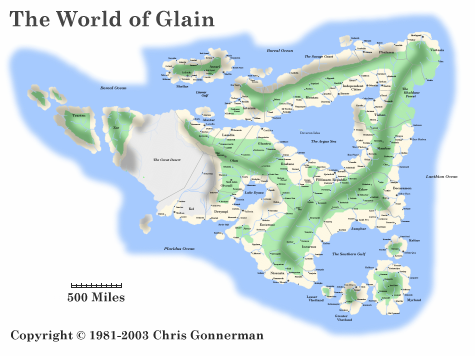 The World of Glain is my original (A)D&D campaign world. I created it in 1981, for the Basic/Expert D&D game. In the summer of 1983 I rewrote it for AD&D (1st Edition, obviously) and in 1985 or thereabouts rewrote it again for Bard Games' Arcanum rules. Here I go again, after a very long hiatus. The material presented here is for my Project 74 Alternate Core Rules, but should be usable for any more-or-less D&D rule system.